Crown Colony Golf & Country Club (Fort Myers) is located in a 403-acre gated community that offers beautiful homes and magnificent amenities in a prime location. The magnificent Crown Colony golf course has been rated one of the toughest and most challenging Southwest Florida Golf Courses. Five sets of tees create an enjoyable experience for golfers of every level. The Ron Garl-designed, 18-hole golf course has the overall character of classic Florida golf design with touches of the old Scottish and Irish links-style courses. The fairways and greens are creatively routed around the site’s native wetlands, mature pines and scrub oaks to produce a highly strategic layout of outstanding variety and interest. The 18-hole Championship Course designed by world renowned golf course architect Ron Garl forms the centerpiece for the finest in social gathering and pampering of any club in the area. The course is the first United States Golf course to use Seashore Paspalum hybrid grass throughout the entire facility. Five sets of tees create an enjoyable experience for golfers of every level. Crown Colony offers a vast variety of associations and events to accommodate golf members which include, but are not limited to: Men’s Golf Association, Ladies’ 18-hole and 9-hole Associations, Couples’ League, and Member-Guest Events for Men & Women. The luxurious clubhouse features a formal dining room, informal grille room and terrace, as well as social rooms, and men’s and women’s locker rooms. Members enjoy the 18,000 square foot clubhouse which serves as the main hub for most of the member activities. It serves as the central nerve center attracting our members to stay and reside for meals and social events. It also serves as a second home to the membership base due to the warm welcome you receive when you are there! It has a fully stocked bar to serve members and guests needs. The Executive Chef strives to provide titillating treats from fine dining, theme buffets, home-style meals and pub style menu. The clubhouse also provides for numerous groups including men’s and ladies’ bridge, couple’s bridge, Texas Hold’em, and Mah Jongg. The Administration Office is located in the Clubhouse which helps in providing membership transfers, maintaining member files, and the day-to-day administration of Crown Colony Golf & Country Club.What sets them apart from other clubs are the members. Members are down to earth and friendly. Don’t be surprised on a Wednesday night when you’re asked to get up and dance or join another couple for dinner. Members are eager to play, eager to talk and laugh, and eager to meet new ones. You can contact the HOA directly at 239-274-6801. 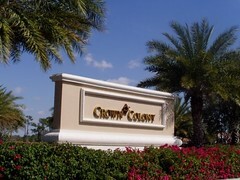 Check out my Gated Community Resource Guide that includes detailed information about Crown Colony. Contact me for more info about this beautiful community! You can also view all current homes for sale in Crown Colony Golf & Country Club. Posted on April 11, 2013, in Real Estate and tagged Buy a Home, Buyer, Crown Colony Golf & Country Club, Fort Myers, Fort Myers Real Estate Agent, Fort Myers Realtor, Gated Community, Gated Community Resource Guide, Kristen Pell, Property Guiding, Real Estate Biz, Ron Garl, Seashore Paspalum, SWFL Real Estate. Bookmark the permalink. Leave a comment.